Usha Ascot boasts of all the homely comforts and facilities one could ask for lined up below are a few of them, take a look. 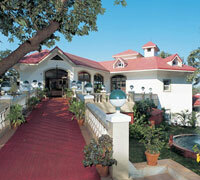 Our resort has all the facilities that one could ask for and to name a few, we have a Restaurant serving PURE VEG. Cuisine with all varieties ranging from Indian, Chinese, Continental food, a Swimming Pool with a Sunken Bar and a Open Restaurant, Permit Room, Health Club with Steam room, Sauna, Jacuzzi, and Massage facility, Indoor recreation like Table Tennis, Carrom, and Badminton in the outdoor and newly added AC Pool Parlour and Discotheque, In-house Laundry and bakery and a full capacity stand by Generator to avoid power failures etc. and last but not the least, the only Resort at Matheran with 100% Air Conditioned Cottages with 80% of them with a pool view, every room has all the modern amenities like Color TV, Telephone, Running Hot & Cold water in bathrooms, well furnished interiors and a personal sit-out balcony. Please click here to view more Hotel Facilities.